Frozen shoulder surgery usually involves an arthroscopic capsular release. The aim is to release the tight capsule in order to improve both pain and movement. When should you consider surgery for frozen shoulder? Frozen shoulder is often a self-limiting condition. People with mild symptoms and a confirmed diagnosis may therefore choose to simply wait for their symptoms to settle spontaneously, though this does take an average of 2 years. If symptoms are severe or persistent, then you may wish to consider surgery in order to speed up the recovery. What is an arthroscopic capsular release? 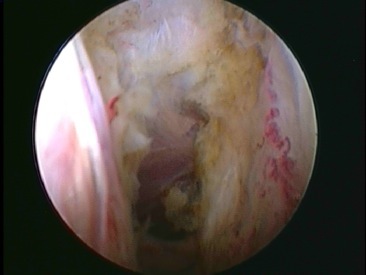 Arthroscopic capsular release is a keyhole operation. A telescope is inserted through a 5-10mm incision on the back of your shoulder in order to inspect the inside of the joint. A small diathermy cutting device is inserted through a similar incision on the front of your shoulder. This is used to release the tight capsule in order to restore shoulder movement. The operation is performed under a general anaesthetic (you will be asleep). You will usually also have a regional nerve block. This means that the anaesthetist will inject local anaesthetic around the nerves to your arm just above your shoulder. The aim is to minimise post-operative pain by numbing your arm for 12-24 hours after the operation. Once you have come round from the anaesthetic, you will be transferred back to the ward. While the nerve block is working, your arm will be in a sling in order to support it, but also to maintain the capsule in a stretched out position. However it is important to get the shoulder moving as quickly as possible, so the sling should be discarded as soon as the nerve block has worn off. The ward physiotherapist will give you some simple exercises to help with this, but you will also need regular physiotherapy sessions after going home. You will be given pain killers to take home. Please bear in mind that the effects of the nerve block will wear off after 12 to 24 hours. It is therefore a good idea to start taking pain-killers before the shoulder starts to become sore (about 10 hours after the operation). Most people notice a significant improvement in pain and movement almost straight away. However your body will naturally produce scar tissue as it heals the released capsule, so some recurrent stiffness is inevitable. It can take 6 months or so for maximum recovery. Don’t try and be brave! It is important to take regular pain-killers and get the shoulder moving. If you try to tough it out, you are less likely to move the shoulder which will increase the risk of recurrent stiffness. You should be doing your stretching exercises at least three times a day. This depends on the nature of your job. If it is sedentary then you should be able to return to work after 2 or 3 weeks, though it is important to do so gradually. If you have a heavier job, then it is likely to be at least six weeks before you can return to work, though you may be able to go back sooner on light duties. Legally, you need to be able to drive in full control of your vehicle. This usually means somewhere between 2 and 6 weeks. It is obviously a good idea to start with short distances and to build up gradually. As with any operation, there is a small risk of infection, nerve damage or bleeding. However these risks are very small with keyhole surgery. The main risk is of recurrent symptoms. A small amount of postoperative stiffness is inevitable, but occasionally the shoulder can stiffen back up to its preoperative state. This complication is more common in diabetics. Posted in Frozen shoulder, Shoulder Problems, Shoulder Surgery.